"We must all grab onto ourselves with such fierceness, no matter what this world dishes up. I don't even know how to describe what this portrait means to me but it has been significant to my healing. I know that I am still a beautiful, sensual and strong woman." As photographers, we have the privilege of documenting personal history. Once in a while, we have the opportunity to create an image that has far greater meaning and impact than usual on the lives of our clients. I had such an opportunity recently, and I took it. During a portrait shoot with an actor, Kimberly King, she told me about her friend Lynnda Ferguson. 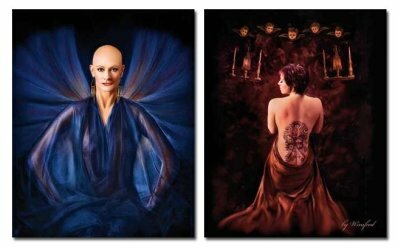 An accomplished New York stage and television actor who had recently come to Seattle to be treated for a very aggressive form of breast cancer, Lynnda wanted a portrait created, portraying herself as Cleopatra. However, because she had to commence chemotherapy right away, a portrait session would be some time away. The following day, during my twice-weekly yoga class, I had an experience unlike any I'd ever had before. I received a communication about Lynnda. It was not telling me that she was going to die, but that an important portrait needed to be created for her to hold onto now. Not a Cleopatra portrait, it would reflect who she really was. As I sat in class, the details of her portrait unfolded. It came to me effortlessly. I saw her expression, the pose of her body, and some elements of the background. I had never met nor seen this person yet I knew what this portrait had to look like and communicate. She would be poised, strong, and confident - a warrior, determined to defeat the cancer. It would serve as her constant reminder to hold steadfast and remain confident as she undertook the next stage of her lifesaving, albeit disfiguring, treatment. Already I could feel the power of the image I would create. Lynnda would have a radical mastectomy as soon as the doctors felt they had contained the spread of this disease. My vision of Lynnda preoccupied me throughout my class. I have never been so distracted before. 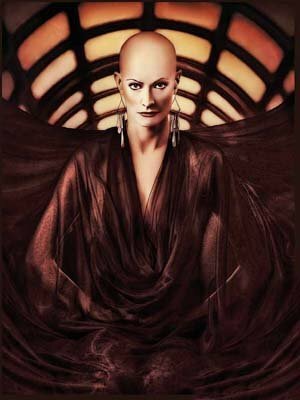 It included a completely bald head with her draped in black sheers, a hint of her breast showing, looking strong, confident, and beautiful. The following evening I received a call from Kimberly. Lynnda wanted her portrait created. I was thrilled. 'Give me an hour,' I requested. I didn't know exactly what to expect, but I needed to be ready. I began by preparing water for tea.